It is a travel day today from Beijing to Shanghai. We got to the airport quickly so had time to relax over a cup of tea, coffee and rolls The plane loaded quickly, left early. We had the usual meal, this time chicken/rice and pork/noodles. I saved the squidslices for my cousin. The taxi line was LONG. 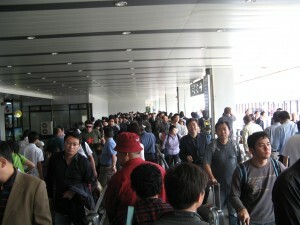 The traffic was stop and go from the airport to the tunnel under the Huang Pu. Then it was a short few minutes to the apartment. It is interesting to see all the different shaped skyscrapers, each with a different architectural topping. Shanghai has a law that all new buildings must be topped with a different architectural construction. My cousin met us at the door and we relaxed until about 7 when his wife was done with work. She works nearby so we walked over to her office building which is on the river. We enjoyed the view from her office of the river and old/new Shanghai, watched the boat traffic, and many of the tourist boats all lit up. Then we went to very nice restaurant on the fourth floor of her office building with a table at the window. The food was excellent. My fingers still get mild cramps from using the chopsticks but we are getting better. We have yet to ask for a fork! (No food pictures). Got home about 10PM and quickly fell asleep. As a result, this blog entry is a bit late, but maybe better late.....??? ?